Manila, 25 October 2017 – Last month, an international team of scientists and explorers reported an unusual find: two large chunks of polystyrene lyingon ice floes in a previously inaccessible part of the Arctic Ocean. The surprise discovery – hundreds of miles from land – is the first time plastic debris had been recorded in the area, which is usually covered in sea ice. Tim Gordon, the expedition’s lead scientist, said it confirmed just how far plastic pollution had reached. And he raised concerns that as the ice melts, more plastics will be released into the pristine seas, with a devastating effect on wildlife. The world’s oceans are a dumping ground for human rubbish of all kinds, with plastic being the principal modern pollutant. Researchers have estimated that more than 5 trillion pieces of plastic weighing over 250,000 tons are floating in seas across the globe. It is well known that large plastic items injure and kill many species of birds, turtles, sharks and marine mammals that are threatened with extinction. Entanglement in and ingestion of marine debris are both conservation and welfare concerns, yet the non-lethal impact of plastics is lesser known. 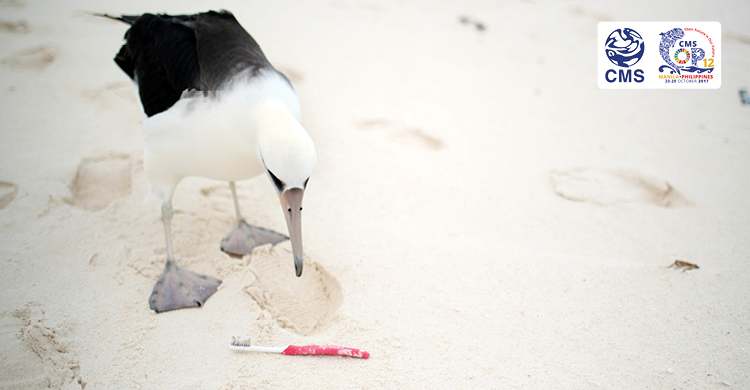 That of micro-plastics – smaller than 5mm in diameter - is even more difficult to assess. Scientists believe that contaminants in these tiny plastic particles can make their way into the food chain, and may ultimately affect human consumers. The management of marine debris requires a massive collaborative effort backed by government, international organizations, maritime authorities, shipping operators, industry bodies and consumers. A number of important resolutions have been adopted at high level including on Marine Plastic Debris and Micro Plastics by more than 150 countries at the first United Nations Environment Assembly (UNEA) in 2014. Substantial work is also being undertaken by other regional and global instruments and by governments across the world. The Convention on Migratory Species (CMS) is particularly concerned about the impact of marine pollution on animals and ecosystems affecting migratory species throughout their range. To this end, CMS has consolidated two resolutions concerning management of marine debris to be presented to Parties at their COP12 summit in Manila in October. The consolidated resolution emphasizes that preventing waste from reaching the marine environment is the most effective way to address this problem. It also stressesthat despite the knowledge gaps relating to marine debris and its impacts on migratory marine wildlife, immediate action should be taken to prevent debris reaching the marine environment. The resolution inter alia encourages countries to identify areas of concern, as well as to work regionally with other countries to identify the sources and impacts of marine debris. It calls upon Parties to address the issue of abandoned, lost or otherwise discarded fishing gear and urges shipping operators and other industries involved with the international transport of goods to promote environmental standards and best practice. The resolution also addresses the need for public awareness and education campaigns, including by industry bodies and recommends that countries develop national plans of action to address the issue of marine debris. View here the full proposal.